On October 19, LACOL held a webinar with special guests Melissa Eblen-Zayas and Janet Russell from Carleton College. 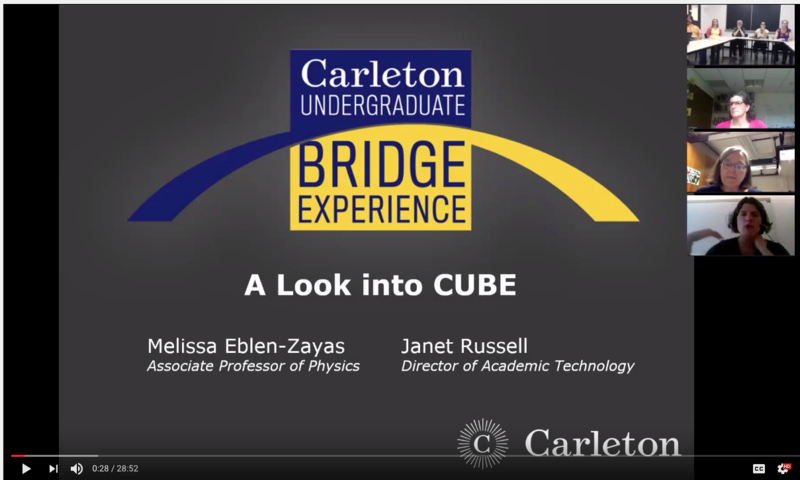 In this one-hour session, Melissa and Janet shared their experiences running the first iteration of the ‘Carleton Undergraduate Bridge Experience’ or CUBE, a new online summer bridge program designed to support entering students with quantitative skills and reasoning. Carleton’s creative approach to developing CUBE riveted the audience at the June LACOL workshop as the pilot was just getting underway. Now in this “debrief” session, you can hear all about what went into running the program in the first round, how students responded, and the lessons that were learned. The meeting was held in Zoom with ample opportunity for Q&A and discussion. Contact Liz Evans (eevans@haverford.edu) for more information.